Éric Abidal has confirmed he is to leave Barcelona after the Catalan giants decided they would not offer him a new deal to stay at the Camp Nou. 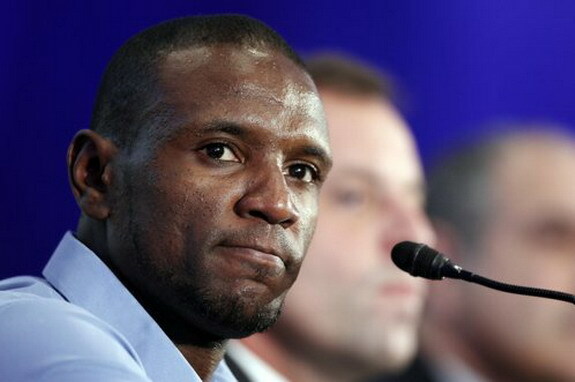 Abidal, who fought back from a liver tumor and a liver transplant to play again, had hoped to be offered a new deal. But the 33-year-old told a news conference on Thursday that his time with Barça would end when his current contract expires this June. He said: "I have played six years at Barça. The experience has been the strongest in my life. During these six year I have had wonderful teammates, who are the best in the world. "Thanks to all the coaches who have had confidence in me, all the doctors and to doctor Medina (who operated on Abidal). 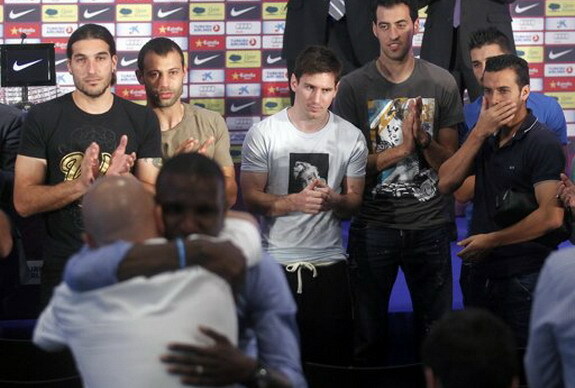 "Thanks to my family, to my cousin (who donated part of his liver to Abidal), my wife and my daughters. I had two objectives - to fight for my children to see them grow, and to return to play." Health problems largely kept Abidal out of action in the past two seasons as he was diagnosed with a tumour in his liver in March 2011 and underwent a transplant last year. The French defender added: "I would have liked to have played on at Barça, but I have to respect the decision of the club. "I'll be sure to return because I have an interesting proposal from Barça. I have to think about it, but I appreciate the gesture. "Thank you to the fans of Barcelona and to the people who have thought about me. Thank you and long live Barça!" Meanwhile, Barcelona president Sandro Rosell said the door was open for Abidal to return as the club's academy staff once he hangs up his boots. Rosell said: "I announce that we are not saying goodbye, but 'see you in the future'. We will say that until he decides. "When he wants to, the doors at Barça will be open for him to head our football schools worldwide. "The position requires knowledge of football and Éric knows a lot. For his education and humility, he has the ideal profile. "I know that when he returns we will think of the ways in which he can help us, and he will." Asked about the evaluation of why Abidal could not play on at the club, sporting director Andoni Zubizarreta answered: "It is difficult to say no. Saying yes is always easier. "The process was not a one-day meeting. We did not talk about his illness. Throughout this process we have spoken about the individual, the medical part, the footballing part, the contractual side. We are taking steps based on that. "There was a complete consensus on this decision. From everyone. These are decisions of the club." Abidal joined Barcelona from Olympique Lyon in 2007 and had since made nearly 200 official appearances for the Blaugrana, winning four Liga titles and two Champions Leagues in the process.